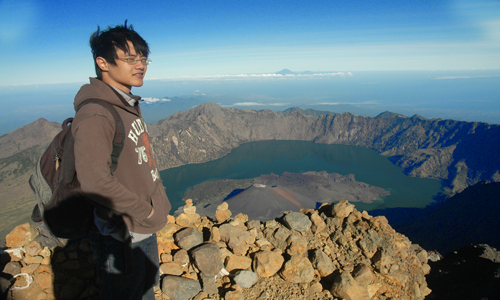 Registration at Rinjani Information Center (RIC) 1051M and start the trek to Pos 1 (Pemantauan) 1300M, walking time is about 2 hours. We take a rest for 5 minute at Pos 1 (pemantauan,) and then continue to Pos 2 (Tengengean) 1500M walking time about 1 hour. We take a rest here for 5 minutes at Pos 2 (Tengengean ), and then continue to Pos 3 (Pada Balong ) 1800M, walking time is about 1 hour. We rest for 2 hours at Pos 3, have lunch, and a hot drink (tea, coffee, hot chocolate or lemon tea). After lunch and a rest, we continue to Sembalun Crater Rim (Pelawangan Sembalun) 2639M, walking time 3 hours inclding a prolonged steep climb. 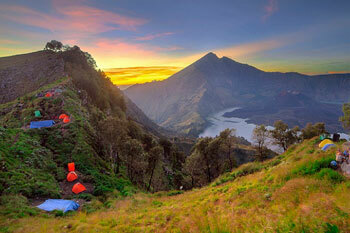 We will camp the night at Sembalun Crater Rim, and from here enjoy the incredible view. 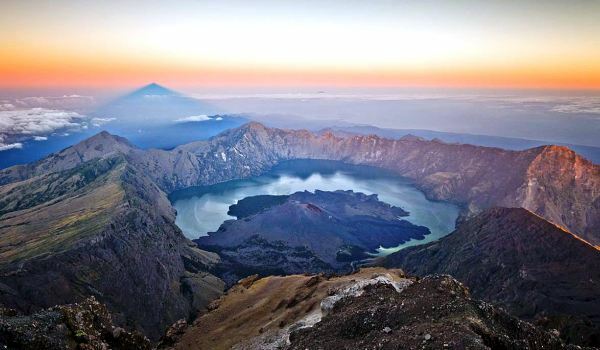 As the sun sets, you can see Segara Anak Lake, Sembalun Village, the summit of Mt. 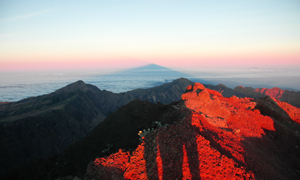 Rinjani and Mt. 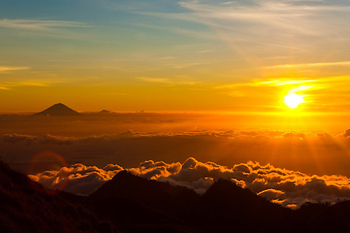 Agung in Bali. We wake up at 02.00am and have a light breakfast. 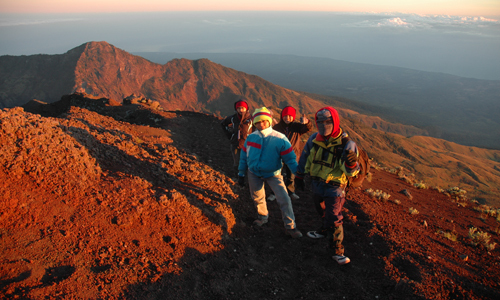 At 03.00am start trekkring to the Rinjani Summit (3672M) Walking time about 3 hours and 40 minutes. The 1st stage is a moderate climb for 120 Minutes; the 2nd stage is a fairly easy but long trek. The last hour is very steep and difficult. (There are many loose stones, and as you take two steps forward you will slip one step back.) 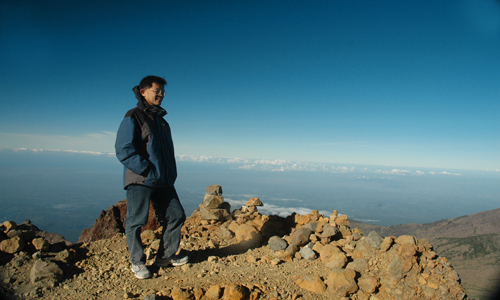 From the Summit, you can see all of Lombok Island, Bali, Sumbawa and Segara Anak Lake. 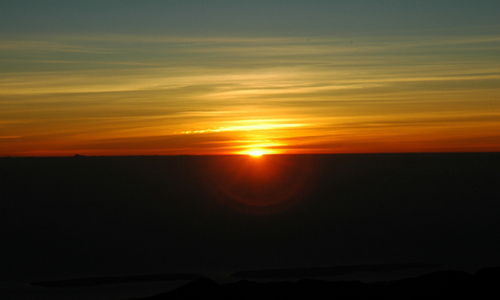 After sunrise we will go down to the Sembalun Crater Rim and have a hot Breakfast. After breakfast and a rest, we will then return back down to Sembalun Village walking time 5 hours, and this is the end of the Trekking program.